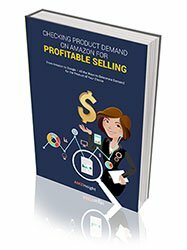 How to Check Product Demand on Amazon for Profitable Selling? Quite often we have experienced that new sellers are always struggling to find the high demand and profitable products to sell on Amazon. In fact, most of the newbies don’t even know how to start their research to check the demand of products. We have complied few ways to check the product demand on Amazon in this eBook. Download to learn what tools and ways can help you in this regard. How to use Amazon for product demand research? How to use Google for product demand research? What are the other ways to know product demand?